I’ve missed creating these, and its time to get back to having fun with fake ads, so here’s the next one. And no one answer this ad but me. I want this little guy! And this is a sort of background information on something I’ll write based on a story idea by my little guy Hopier, + a Flagg3D image combination I’ll post in the near future. Both are right up my alley in such a strong way, I can’t help but feel my heart pound furiously when I think of how much fun I’ll have writing that story. You better hurry! I hear there are offers! 😉 What a fun post! shakes head There are offers indeed. I’ve been emailed phone numbers, love notes, photos, admiration, needs, and wants. Sorry, ladies. 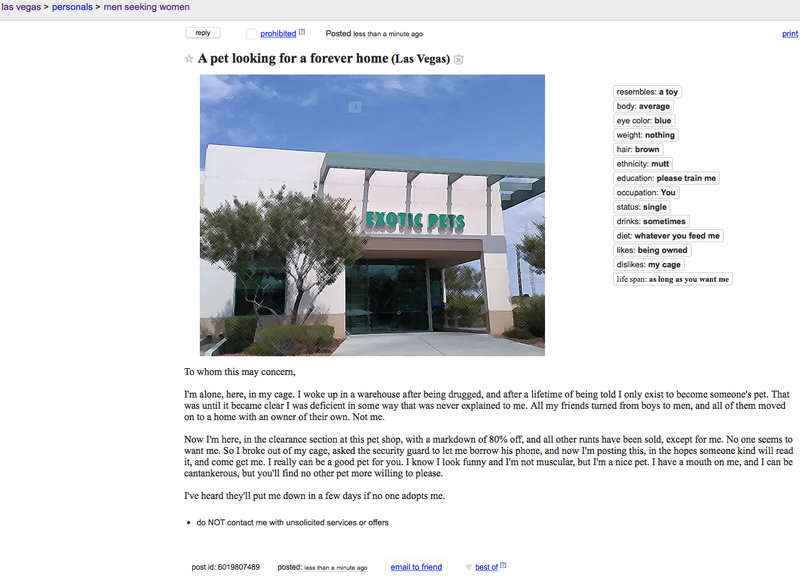 This particular pet has been adopted, and his owner will not let him go. Keep looking, and good luck. You’re going to need it. This man looking for a forever home might just be someone’s forever man. A giantess lid for every little pot. I love these, thanks for the smiles. Thank you, meremention. This is the one ad that got the most responses, among all of them that I’ve created. it really hit some kind of button, and it’s interesting to me how many women do think the idea of a man as a pet is appealing. They are not wrong. Alas I deleted them all. There were photos and phone numbers and what seemed like heartfelt responses, so I sent them all to the trash (though I didn’t feel they were trash), and emptied it. If there’s ever a next time I get such responses, I’ll remember to share them in a way that doesn’t feel like a violation of privacy… hmm.